The origin of the Greek gift otherwise known as the "Trojan horse" is a legendary event that took place during the Trojan war. During this period, the Greeks sought for an access route to the city of Troy and they came up with a trick. The Greeks, therefore, pretended to have abandoned the war and left the Trojan horse behind at the entrance of the city of Troy which appears to the inhabitants of Troy to have been an offering for their gods by the Greeks. The Trojan horse itself was actually a trap loaded with arms and brave Greek soldiers; it was massively built to accomodate many of the brave warriors who were ready to attack the city right from within, if eventually it was taken inside the city. Fortunately, to the people of Troy, a Trojan priest saw the horse and understood its significance, so he cried out: "Do not trust the Greeks, even if they left us a gift." However, the people refused to heed to the warnings of the priest and proceeded to take the Trojan horse right inside the heart of the city and kept it before their gods without the slightest knowledge that it was actually a ploy by the Greeks to have access to the city of Troy and destroy them from within. Therefore, by the time the inhabitants of Troy realised what was going on, their city fell under attack and was overrun by the Greek soldiers whom were hiding inside the Trojan horse. The Greek soldiers hiding inside the Trojan horse, were even the ones who opened gates for their compatriots who were battle-ready, waiting outside the city. And that was how the city of Troy was completely destroyed. The moral lessons to be learnt from this story is simply teaching us never to trust a person who has been our enemy for so long, even if he/she has recently shown a change of behavior. In order to be on the safer side, do not accept his/her sudden show of care and concern towards you because there must have been something sinister about the sudden change. 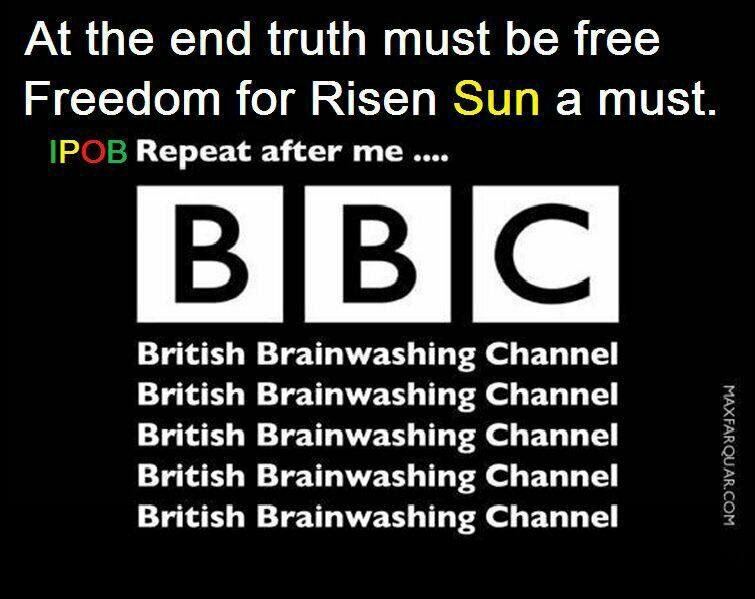 Biafrans, this recent launching of BBC IGBO SERVICE by the British is a Trojan horse and must be seen as such, we need to trade with caution when dealing with the British, for they never meant well for us. 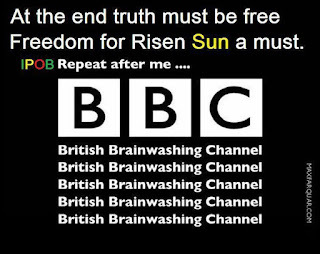 The British devoted their media outfit popularly knows as 'British Broadcasting Corporation(BBC)', to fight the Biafrans before and after the civil war and has continued to be a tool of oppression and subjugation against the Biafrans till date. Just like the Trojan priest warned the inhabitants of Troy in those days to beware of Greek gift, Radio Biafra London and Biafra Writers is therefore sounding this gong of warning for our people to trade with caution. Because this latest move by the British has something sinister about it and must not be taken into our hearts in order to be on a safer side. Recall that during the incarceration and detention of leader of the Indigenous People of Biafra, Mazi Nnamdi Kanu, in a Nigerian prison at Kuje, Abuja, there was a lot of speculations from many quarters that the only solution to quell the rising agitation in the Southeast by Biafrans is to give them an Igbo president as if that was what brought about the agitation. However, when they discovered that the agitation was not all about Igbo presidency, but total freedom for Biafrans from subjugation and oppression in Nigeria, the topic was changed to 'restructuring' which they are now using as a bait to contine to entrap unsuspecting Biafrans inside the damn British contraption known as Nigeria. Now that Biafrans are preparing for a referendum vote to determine whether to continue staying in Nigeria or not, the British whom were the chief benefactor of the business enterprise called Nigeria, came up with this gesture by trying to show us love and care after using the same media platform to propagate evil and hate against us which resulted in the loss of over 2.5 million Biafrans during their conspired war of blockade and starvation. It was the same British through BBC who ensured that men and women of goodwill do not come to know about the real stories concerning the genocide perpetrated against the Biafrans during the Nigeria-Biafra war which they fully sponsored, rather they, through the BBC, told the international community that what was going-on in Biafra was a mere fight between rebels and the Nigerian military government while genocide was being committed with the intention of annihiliating Biafrans from the surface of the earth out the face of the earth for them to have unrestricted access to our God-given mineral resources. Fellow Biafrans, we must remain focused at this point in time which is the most important time in the struggle for the restoration of the sovereign state of Biafra and must not allow the British who only cares about the crude oil in your land more than your lives. Thr bottom line is that the sudden but belated launching of the BBC Igbo service is a Greek gift otherwise known as Trojan horse. Yahweh bless u. That pass this information british are the Preator of what is going on Nigeria.nigeria is thier business center.what the young man write above is the real thing,real fact.british is the real demon we are seeing on earth. When ever they care for they have stolen everything you have. Wicked set of people that is why they turn the of yahweh to another thing. May yehweh have mercy on them.